To Challenge Anti-LGBTI Attitudes And Foster Dialogue, He Started A Radio Show In Kinshasa : Goats and Soda Patou Izai wanted to challenge the negative comments about the LGBTI community in the Democratic Republic of Congo — and create a space for dialogue. So he started a radio show. 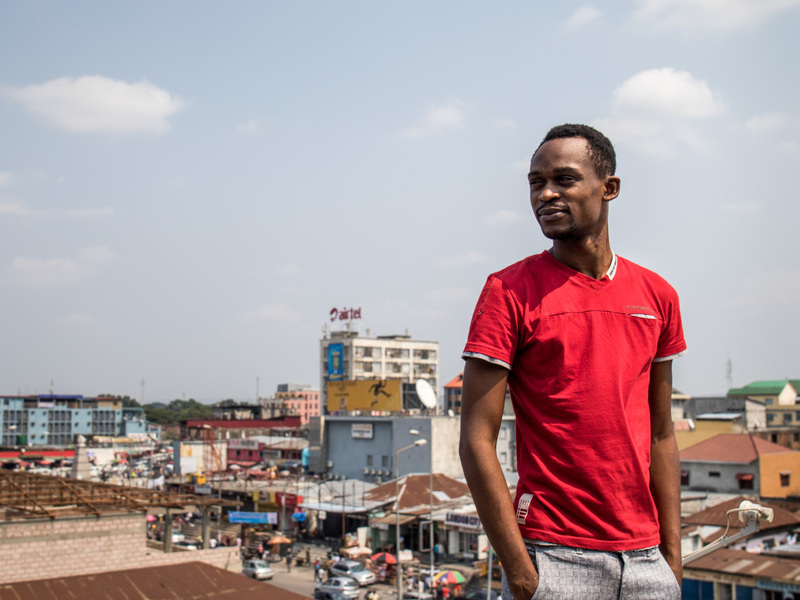 Patou Izai stands on the roof above the office of the radio show he produces in Kinshasa, capital of Democratic Republic of Congo, for the LGBTI community. Sitting at his desk in a stuffy office with a rainbow flag hanging behind him, 31-year-old Patou Izai says it takes a lot of courage to come out as gay in Kinshasa, the sprawling capital city of Democratic Republic of Congo (DRC). Although this vast, volatile Central African nation does not have the harsh anti-gay laws adopted by neighbors such as Uganda, deeply ingrained conservative cultural norms routinely stigmatize, silence and lead to physical threats against LGBTI (lesbian, gay, bisexual, transgender and intersex) people. "You're basically excluded from society," Izai says. "This means that very, very few LGBTI people are open about their sexual orientation. They have too much to lose by being themselves." In 2015, Izai, a self-employed IT technician, decided to start a weekly radio program that seeks to challenge the negative attitudes toward Kinshasa's LGBTI community. "The idea to start 'Jeuniafrica' came from a strong need to talk, to be heard," says Izai, who came out at age 24. "Whenever LGBTI issues were being talked about, it was always in a pejorative manner, whether in the media, in politics or wherever else. I felt it was very important to try to provide a counter discourse." Weekly SoundCloud episodes in French have drawn listeners from across Francophone Africa and the Congolese diaspora. And since September 2016, Jeuniafrica has aired twice weekly on one of Kinshasa's best-known radio stations, RTVS1 FM. The FM shows are produced in Lingala, the native tongue in Kinshasa. Every Wednesday, a team of nine 20-somethings join Izai for an editorial meeting. The team members, each of whom is paid a small stipend, passionately discuss topics for the week's shows. "Jeuniafrica" has cultivated a snappy conversational style interspersed with snippets of on-the-ground reporting, man-on-the-street quotes and in-studio interviews with church leaders, doctors, human rights workers, journalists and psychologists. Themes range from basic sexual health tips to dealing with depression to reconciling homosexuality and religion. A particularly popular episode asked Kinois, as Kinshasa residents self-identify, how they'd react to finding out a close family member was gay. All of the interviewees said they would disown their relative. Izai says family rejection is exceptionally common for LGBTI people in DRC. "'Jeuniafrica' can be a kind of substitute for that lost social structure," Izai says. According to Rebecca, a shy 29-year-old who is one of three lesbians on the "Jeuniafrica" team, LGBTI Kinois face similar rejection in the job market. Rebecca, who asked that her last name not be used to protect her privacy, has been unemployed for more than two years. The $40 monthly stipend she receives for "Jeuniafrica" is not enough to live on, so she depends on her family — to whom she is not out — for support. "Even if I have the competence, employers won't consider me because they'll say I'm too masculine," she says. According to an October report from a group of Congolese human rights organizations, the combination of familial and workplace rejection pushes many LGBTI people onto the streets or into prostitution, where they risk becoming victims of violence or contracting HIV. LGBTI people across DRC are reluctant to seek out medical treatment or report cases of abuse for fear of prejudicial treatment, the report says. "Jeuniafrica" confronts these issues head-on. Its team members pointedly cite sections of Congolese law pertaining to universal human rights and share details of LGBTI-friendly medical centers and health practitioners. Last year they aired a whole show on destigmatizing condoms, which are often demonized by DRC's conservative cultural mores. According to Bob Yala, director of Congolese nonprofit Secteur Media, radio is a particularly accessible medium for diffusing these kinds of messages in DRC, a country with low internet connectivity, an adult literacy rate around 60 percent and a strong oral tradition. "Oral accounts are ingrained in our culture. This means that radio is often enveloped in a kind of authority and so it can draw on that culture to educate and inform," says Yala, formerly a Radio France Internationale (RFI) journalist. Together with South Africa-based Children's Radio Foundation, Secteur Media helps train and equip the "Jeuniafrica" team. Children's Radio Foundation also covers the reporters' monthly stipend. Local radio can also empower marginalized people to speak out while retaining anonymity, Yala says. Rebecca, who goes by the pseudonym Seygou on air, says "'Jeuniafrica' is the only place where I can talk openly with people who have the same sexual orientation." In doing so, Rebecca believes she can "help other lesbians to open up about their sexuality." Izai admits the response to "Jeuniafrica" shows, beyond its core LGBTI listenership, has been largely negative. People "tell us what we are doing is wrong, that we shouldn't be trying to encourage something that is against the Bible," he says. He draws hope from the testimony of a listener who said he regretted mistreating his brother, who had come out as gay. "He said that having listened to us and then talked things out with his brother, he understands him a little better. This shows that we can have an impact," Izai says. Julie Makuala, executive director of Congolese lesbian rights organization OASIS Club, says "Jeuniafrica" is "undoubtedly an important initiative, and it has the potential to change people's perceptions about the LGBTI community in Kinshasa." She believes it needs to considerably expand its reach to make "a really significant difference." Izai is well aware. He wants to start a YouTube channel and procure a regular slot on national Congolese TV. But this will take time. As well as financial and capacity constraints, he has concerns about the risks of stripping away people's anonymity. He remains unsettled by repeated attempts, most recently in 2014, to pass an anti-gay bill in DRC's National Assembly. The proposed bill would make homosexuality punishable by prison sentence. Izai believes there is still widespread support for such legislation. This adds urgency to his work with "Jeuniafrica," Izai says: "I feel obliged to speak, to call out, to keep reminding society that we homosexuals exist. But I'm also trying to show them that we are more than just our sexuality. We are also human beings."